A sudden onset of blurry vision is a symptom that something is going wrong inside your body. 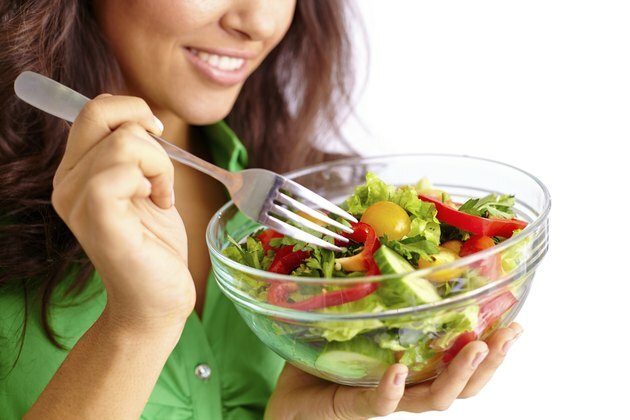 When you are on a severely restricted diet, such as a low-calorie diet, blurry vision may be a sign of hypoglycemia. If you experience hypoglycemia, take action by bringing your blood glucose back up. Then, switch to a healthier diet and reach out to your doctor to determine if there is an underlying cause for your hypoglycemia. Your body relies on blood glucose to function. Your blood glucose provides energy for your working cells. When your blood glucose falls too low, your body may begin to exhibit signs that something is not right, such as blurry vision. An abnormally low blood glucose can lead to a condition known as hypoglycemia. Symptoms of hypoglycemia include blurry vision, nausea, fatigue, hunger, weakness, mood swings, confusion, anxiety, sweating and dizziness. The carbohydrates and calories you eat largely influence your body's blood glucose levels. A quick fix for hypoglycemia is to eat a carbohydrate-rich snack. This can include a tablespoon of sugar or honey or a glass of fruit juice or soda. If you don't treat hypoglycemia as it is happening, you may faint. Prolonged hypoglycemia can lead to coma and death. To prevent negative side effects from your new eating plan, make some changes. Hypoglycemia may be a sign that you are not eating enough. Increase your daily caloric intake. You can also try a different pattern of eating. Frequent, small meals can help you with your weight loss and stabilize your blood sugar, preventing hypoglycemia. To successfully lose weight, you must restrict your caloric intake and increase your caloric burn, but this should be done in a safe manner. Instead of restricting your caloric intake to unsafe levels, follow a moderate deficit diet. This diet, endorsed by the National Heart, Lung and Blood Institute, recommends that women eat between 1,000 and 1,200 calories per day and men consume between 1,200 and 1,600 calories per day. Another healthy component to losing weight is to incorporate regular exercise. Aerobic exercise burns calories and fat, counting toward your daily caloric deficit. If you continue to experience bouts of blurry vision or other symptoms of hypoglycemia, it may warrant a call to your doctor. Blurry vision or hypoglycemia may be a sign of an underlying condition. Contact your doctor right away. In addition, contact your doctor before starting any new exercise or diet program. He may have recommendations for a safe program based on your medical history. What Is a Normal Range of Mg/Dl for Blood Glucose? Why Do I Get Nauseated & Lightheaded if I Don't Eat? What Is a Hypoglycemic Stroke?